On-line mobile phone retailer Clove has now listed the recently launched Motorola Razr, with a shipping date of the start of November and a price of just over £450 – SIM free and unlocked. The Motorola Razr unveiling was first teased in a video trailer at the start of the month, with a tag line promising a new mobile phone which will be faster, thinner, smarter and stronger. It was rumoured there could be a new Motorola Atrix mobile phone on the way, or even a new Razr handset – where both of those have now come true, with the Atrix 2 being announced only last week. 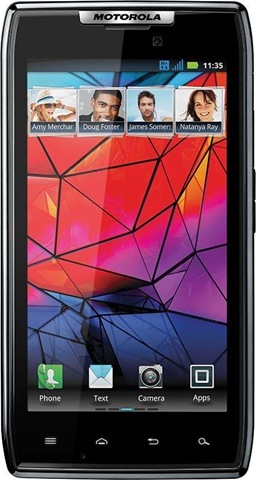 Motorola Razr claims the title of the world’s slimmest phone, with just a 7.1mm thickness and a weight of just 127grams. The handset will ship with a Corning gorilla glass 4.3-inch Super AMOLED display that is similar to the screen sharpness found on the Samsung Galaxy S II, pushing it to 10 million sales worldwide. Moto has noted the phone also has a splash-guard coating and on the circuit boards too. This makes the mobile resilient to slight water damage, where the addition of Kevlar fibre prevents the screen from being overly damaged from scratches and scrapes. Clove has now opened up the ordering of the Motorola Razr with a delivery date of after November 1st, which is when the reseller takes the first delivery of the device.